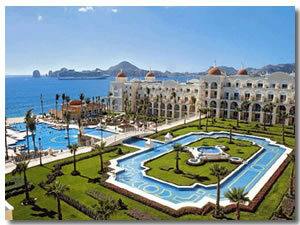 With over 600 rooms the Riu Palace in Cabo San Lucas is a Palace. You even see gardeners working around the clock keeping up the appearence of the grounds. It's a beautiful place, and they plan to keep it that way. First off you will notice the stunning view of the pacific ocean if you have a room on that side of the hotel. Furnished like you would expect a 4 star hotel to be, the only downfall being tiled flooring outside the rooms. This can get a little bit noisy unless you have had a nice drink that you won't here anything. Maids enter your room and re-stock your mini bar everyday. They also upturn your beds, and replace any towels that you use. Being an all inclusive resort a high percentage of the food and drinks come in with the price. The Italian restaurant is overlooking the beach, so provides a panoramic view as well as good food. You can even give the restaurants a miss sometimes and just tuck into the food at the buffets. These are the most popular places in downtown Cabo. Here you will enjoy the Tequila fueled parties. They're not for the faint of heart. There are many other bars and restaurants to visit if you are not after such a energetic evening. You have a lovely, peaceful beach to bronze yourself on but the ocean there is not safe to swim in. This i sdue to the large waves and under-currents. You are however just 10 minutes away from Medano beach where it's safe to swim. You have a couple of nice restaurants to grab some lunch at as well including The Office. Your vacation at the Riu Palace in Cabo San lucas should be one of great views of the ocean, and one of total relaxation. You will have a choice of 2 pools for your daytime tanning, one for activities, and one where peace and quiet is designated. If you expect the odd piece of forgetfulness by the staff you will have a much more enjoyable vacation. As with all hotels and resorts, staff can't please everyone all of the time.